Our nest at Cottages hatched! On the night of June 5th, from 9 pm to 10 pm, we watched 21 little hatchlings struggle and emerge from the sand. We’ve been waiting for this day! Way back on March 31st, we had a late-night visit by a leatherback at Cottages by the Sea. She nested right outside the patio on the beach by Cottages and Sandcastle on the Beach. Our friend Robert spotted the turtle at 3 am (he wondered why a rock was moving!) and alerted us that she was there. We had a Duke University Marine Lab sea turtle class with us, as well as our 2017 turtle team from Sandy Point. We all quietly watched her lay eggs and made careful notes about the location of her nest. It was a beautiful ending to a whirlwind day! We’d participated in the Centennial celebration, our new team had just arrived to start their internship, it was the last day of the sea turtle class and we were all exhausted! The sea turtle class had spent the previous five nights surveying the beaches at Sandy Point (walking over 50 miles) without finding a turtle. With just a few hours left on the island, the class was so lucky to have one come right to them. They decided that her name had to be Joy, for the pure joy they felt in seeing her. Leatherback hatchlings that emerged from the nest on 5 June. They were released on a dark beach away from lights that could disorient them. 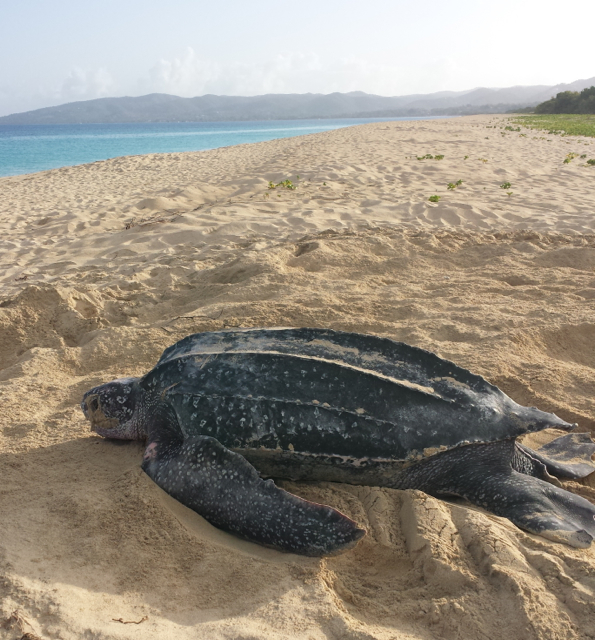 This photograph was taken during the Leatherback Recovery Project at SPNWR with permission from the U.S. Fish and Wildlife Service. An update! On 9 June, we excavated this nest to see what the hatch success was. We do this for two reasons – we want to keep track of how many eggs each leatherback has laid over a season and how many of them hatched and emerged. We also are able to rescue any little hatchlings left behind by their siblings in the main rush to the surface of the sand. When we had all the eggs out of the egg chamber that was ~60 cm deep, we found 22 hatched shells (and one little hatchling still living! ), along with 69 undeveloped eggs. Unfortunately, these eggs just did not develop (there were a lot of storms in early April and the nest had been overwashed several times). But on a happy note, we were able to release the hatchling (little Joy) later that night, after dark.